Beautiful ranch on 1/3 acre at the top of the hill in Leawood. 2 blocks to creek and open space of Weaver park. Open concept great room perfect for entertaining. New hardwoods throughout entire main level. 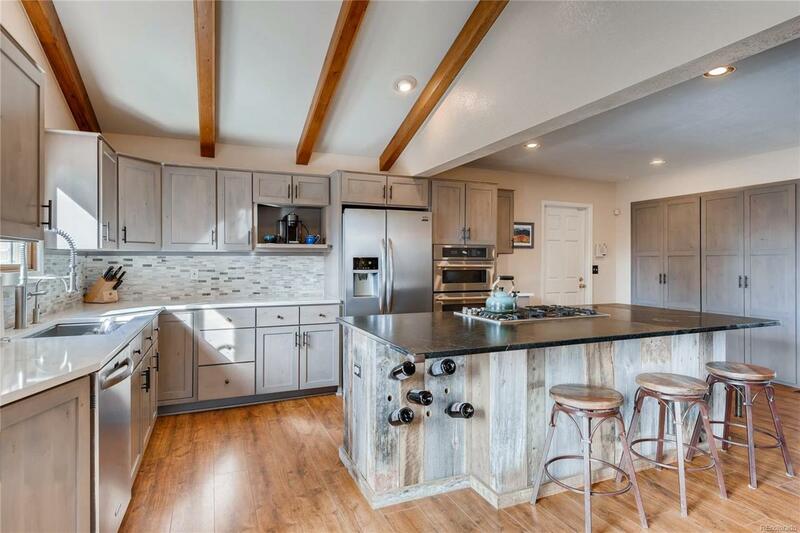 Enjoy a completely redone chef grade kitchen, including stainless steel appliances, soapstone and quartz countertops, gorgeous alder cabinets, and barn wood accent on large kitchen island. Newer roof, large main level master suite with 5 piece bath, custom back patio pour, and hot tub are just some of the great features of this large ranch-style home. 3 bedrooms plus office, 2 full baths and laundry on the main level. Driveway addition fits 3 cars outside the garage. Park-like back and front yard creates idyllic setting for outdoor enjoyment. Basement has tremendous opportunity for additional bedrooms and family room. Currently the basement has 2 non-conforming bedrooms, 3/4 bath, concrete floors and flex area that could be utilized as a large family room.